Again, for this six days reading period, red was the color of choice. In the last 6 days, I have read a total 118 pages, when in fact I should have a total of 630 pages, not what I’ll like. So, with that in mind, I gave myself a few tasks to complete before the month end. Reach the halfway point of Star Wars: Tyrant’s Test. A few simple things to get me going again. Which incidentally, I desperately need. (Y-9) a belated birthday present. Today, among other things, I had the chance to catch up with a good friend, whom, consequently, gave me two really cool gifts. 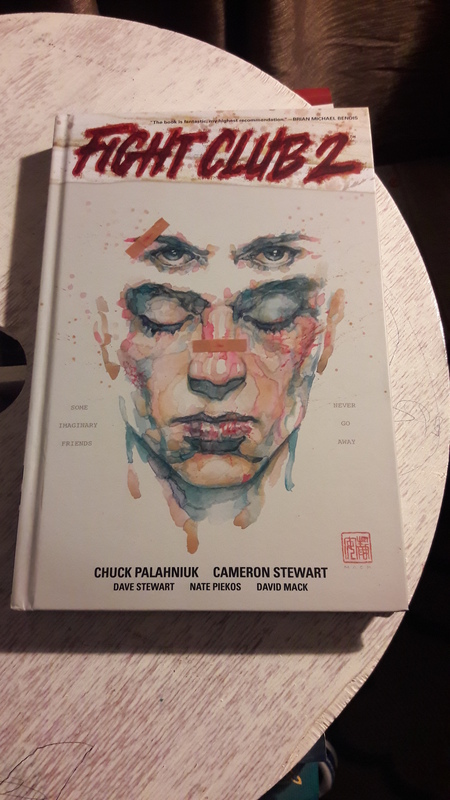 the first was the graphic novel of Fight Club 2, the novel by Chuck Palahniuk is one of my favorite book, I’m eager to see what new trouble Mr. Durden is brewing. The other gift was an illustration for the cover page of my bullet journal, if I was loving my new journal this only makes it more special. Also, I finished reading Star Wars: Shiel of Lies, this gives me a total of 15,525 pages in the year and only 16 books to go. I’m on the verge of finishing one of my digital Star Wars books. if all goes well by the early afternoon it will be done. Also, I keep pounding away at Jerusalem and My Name is Red. I have 84 days left in this ninth year of reading, 17 books and 12,037 pages stand in the way of a successful year. In light of this numbers yesterday evening I took a little time to try and advance with my reading, it was mildly successful, with lots of caffeine and some reading. 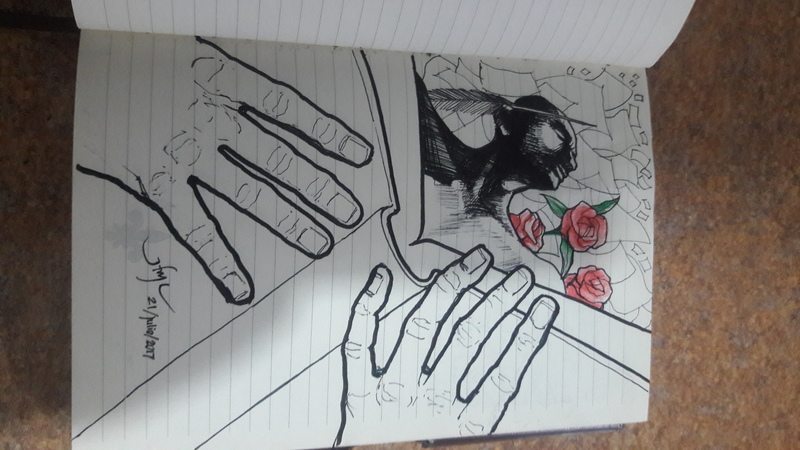 Seeing my journal and the progress for the last few days I find something disturbing. I’m seeing an awful lot of red. This last few days I haven’t read that much. Can’t find my train of thought. Counting last weekend and this three days of the week I have only read 65 pages. I’m going to push forward and hopefully some focus should present itself. Here you can see what I like to call “The Chaos of Lost in a Million Pages”. A hard rain is coming. Finally, after 89 days, I finished Apocalipsis by Stephen King. A really interesting take on a post-apocalyptic society and the constant fight between good and evil. With this, I have reached 15,263 total pages for the year and only 961 pages to reach 200,000. So I did the logical thing after finishing a massive book. I went ahead and started another one. At 1266, Jerusalem by Alan Moore, promises to be a harrowing descent to the haunted streets of Mr. Moore’s hometown, Northampton, England. Also, I keep on chipping away at two other books, 17 to go in the reading list and little time to do it. 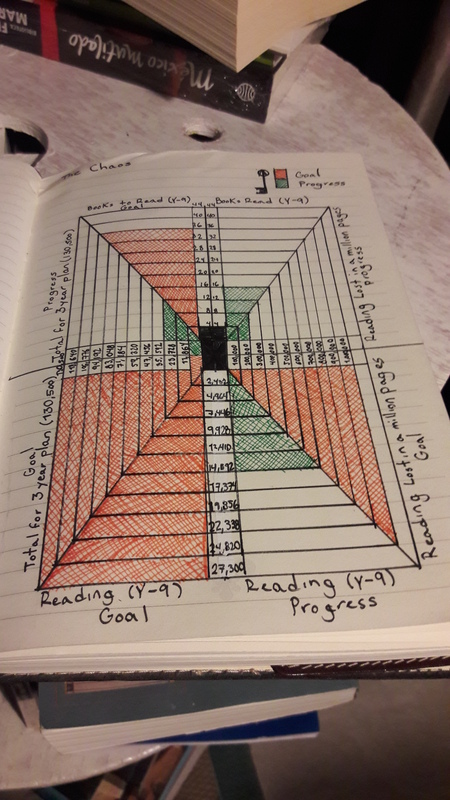 This week also marks the beginning of a new method, at least for me, of keeping track of my reading. Inspired by Bullet Journal , this analog system is the perfect solution for me to keep update my information and have it always at hand. Check their website in the link above, its full of really cool ideas and video tutorials to get you started. Yesterday was slow in all regards. I’m 57 pages from finishing Apocalipsis and with that only 17 books from completing this year list. 12 of this books are in print, and the remaining 5 are Star Wars novels that I have on my phone. With 96 days remaining and 17 books to read, I should be finishing a book every 5.6 days. For now, I’ll focus on Apocalipsis and start with Alan Moore’s Jerusalem, which is one of the big books I have on my list and can’t really read outside the house, you know, because of girth issues. I’ll try to make headway with the digital ones and with the smaller book that I can carry around and focus on the big ones on the evenings/nights. hopefully tomorrow my total count for the year will increase somewhat. Yesterday was a very productive day, to the point that I have only 111 pages to go in Apocalipsis. My intention is to finish it today, read Crimson Vol.1 and hopefully start with Jerusalem in the late afternoon. And device some strategy for the next days to finish around 17 books. For now, some coffee and some reading. 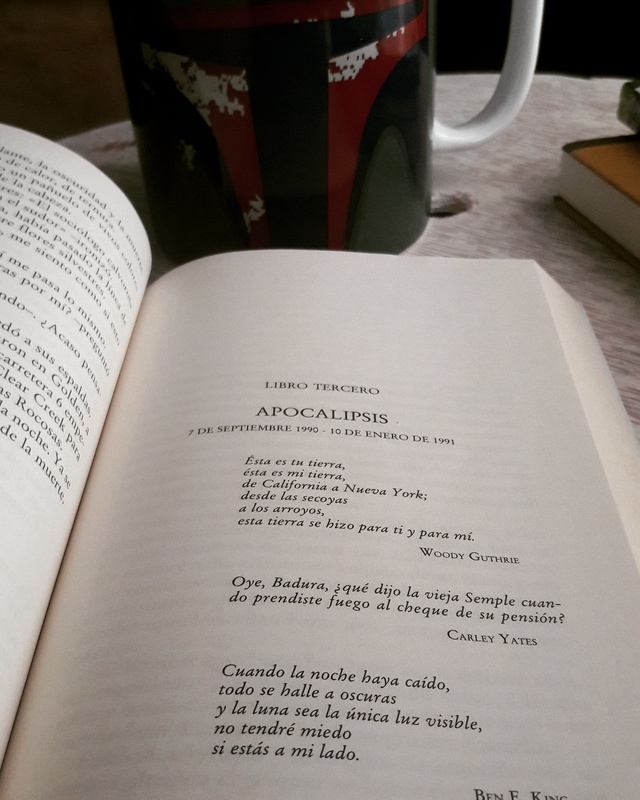 Starting the day with 291 pages to go in Apocalipsis, the plan is to finish by this weekend and start with Jerusalem. Also, I’ll try to finish volume 1 of the comic Crimson, I desperately need some pages, you know to get the wheels rollin.